Though St. Anthony first joined the Augustinian Order, he eventually left it when he was 26 years old and joined the Franciscan Order around 1220 in the hopes of becoming a martyr for his faith. Through his work in Padua in Italy, he became a loved and admired Saint in the Catholic Church, sharing the faith through simplicity — which led to him becoming a Doctor of the Church. 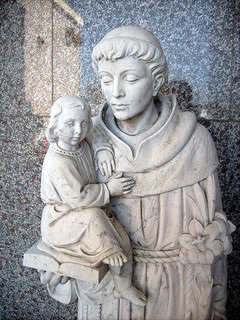 St. Anthony’s Feast Day is traditionally celebrated on June 13th, but you can pray a novena to him any time. He is often invoked for helping to recover lost items, among other intentions. Saint Anthony was born to a wealthy family in Portugal where he was raised, but at an early age and against the wishes of his parents, he left home to join a religious community in the outskirts of Lisbon. After he became a priest, he joined the Augustinian order. Shortly after his time there, he met five Franciscans who were on their way to preach the Gospel in Morocco. He was very attracted to their simple and evangelical lifestyle. When they were martyred while preaching, St. Anthony was inspired by their example and he also became a Franciscan in 1220. He had hoped that he would also become a martyr, and he actually only lived ten more years after he joined the Franciscan Order. It is said that St. Anthony’s teaching of the Catholic Faith was so simple that even the most innocent child could understand it. He was called the, “hammer of the Heretics,” as his protection against their lies was to use the Holy name of Mary. St. Anthony wanted to profess the Catholic Faith with his entire being; with his heart, with his mind, and with his words at every single moment of his life. It is perhaps because of that great intention, that when his body was exhumed after his death, his body had decayed — but his tongue remained uncorrupted.